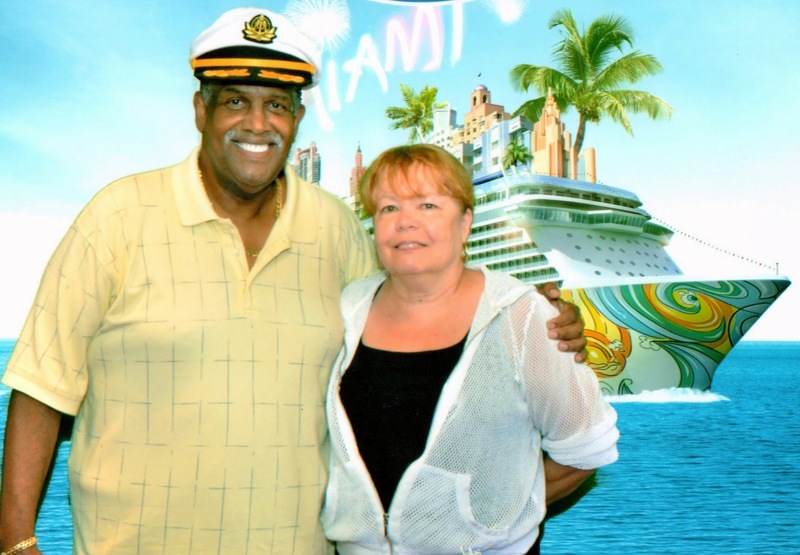 We had a fun time celebrating our 45th wedding anniversary on Norwegian's new ship the Getaway. We've sailed many times with Norwegian, are Lattitude Rewards Members, staying in the Haven section of the ship and really reaped many wonderful onboard benefits by traveling with this cruiseline. It was like a fantasy vacation. The Haven is a collection of luxurious staterooms located on the top levels of the ship. We experienced personalized service that included having a butler and concierge 24 hours a day. We had our own courtyard including a private pool, sundeck, hot tub and fitness room, a private dining room and bar lounge. Our cruise package included free drinks but all Haven dwellers received free champagne, flowers, chocolate covered strawberries (my favorite), fruit platters, Godiva chocolates and so much more. Once I mentioned not seeing any gummi bears in the courtyard like I had seen on another cruise and later that day a bowl of gummi bears showed up in our cabin. My hubby mentioned he couldn't find any oatmeal raisin cookies for snacking and a plateful was delivered each day. Everyone was so friendly. We went to the Captain's Meet and Greet on the second night where you get to know the ship's officers and are treated with free drinks and hors d'oeuvres. There we met a very nice officer by the name of Marites (Tek) Sonza, the Executive Housekeeper. She told us she spent a few months in Germany helping to get the ship ready for launching. 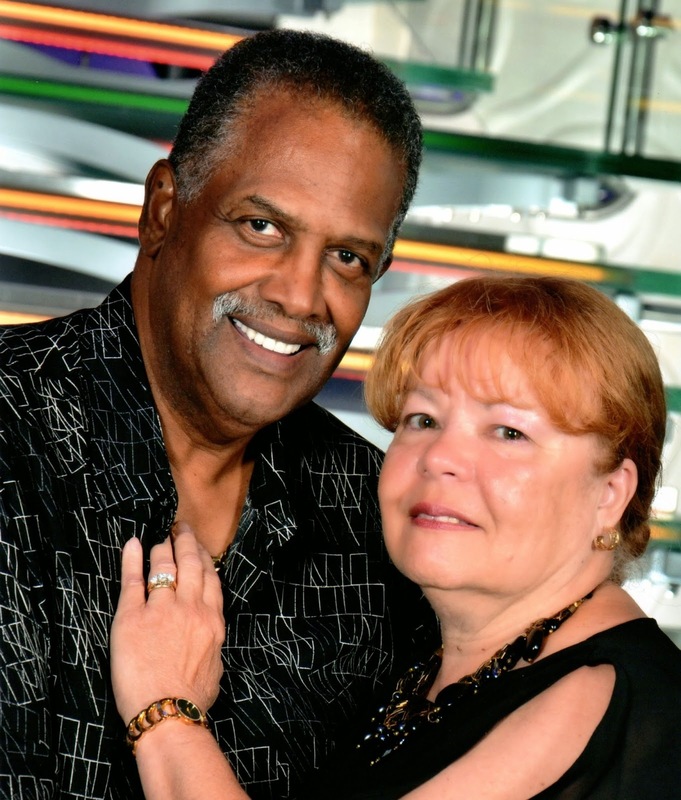 Tek asked if we were celebrating anything while on the ship and we casually mention our 45th wedding anniversary. When we got back to our room, it had been decorated wishing us a Happy Anniversary, including another bottle of champagne and more hors d'oeuvres. It was beyond belief! How wonderful and so thoughtful of Tek and her staff! The cruise lasted seven days and stopped in Philipsburg, St. Maarten, St. Thomas and Nassau. We've been to those places many times over the years and always enjoy re-visiting such interesting spots. I'm not going into any details about the islands . . . I'll just say one word . . . Paradise! This is a view from our balcony of the hotel where we spent our honeymoon in Nassau some forty-five years ago. It was a Sheraton back then and has changed ownership many times since. Nice to see it still looking good and inviting. Besides sunning on deck, going to shows, listening to bands, drinking and eating, during one of the days at sea, I had time to attend a cake decorating class. 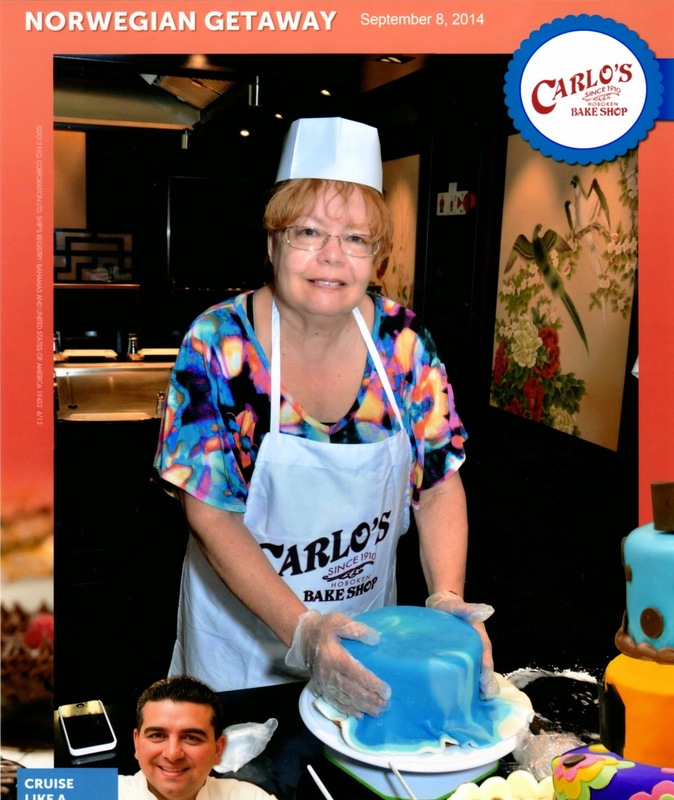 Based on Buddy Valastro, the "Cake Boss," method of decorating cakes, I had a fun time learning some of the tricks of the trade in cake decorating, using fondant on an actual cake. First the chef gave us a lesson on how to work the fondant to decorate the cake and then we tried it on our own. The cake was suppose to be decorated with a beachy theme. I had sand (graham cracker crumbs), an umbrella, bridge, ocean (gel), a shark, surfboard, and octopus . . . can you tell I got carried away with making cute little objects out of fondant? And actually got a certificate for taking the class! We got to take our cakes back to our cabins. It was chocolate and raspberry flavored cake which was so delicious and very, very sweet! All the participants had a picture taken holding their cakes. 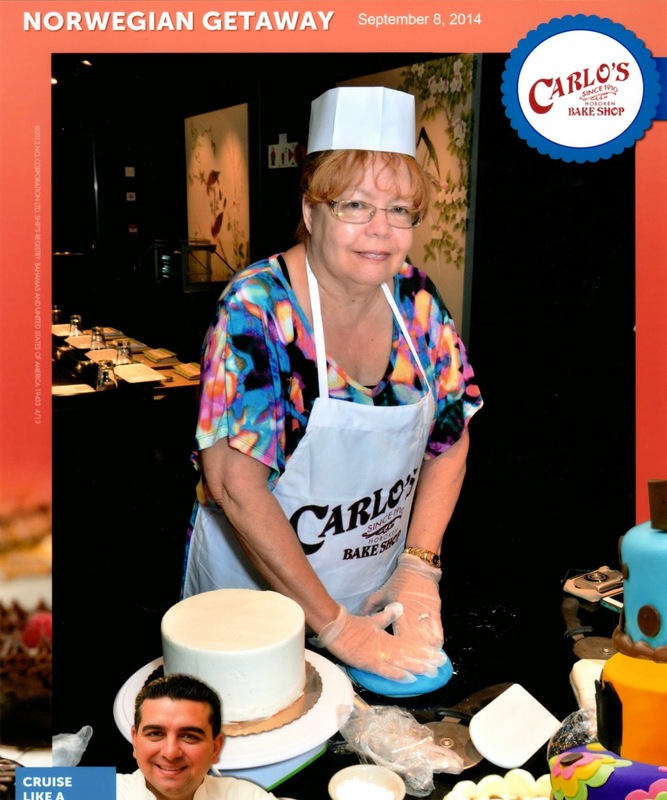 The finished pic had an image of the Cake Boss inserted. In all, it was a very relaxing and wonderful celebration. I highly recommend cruising! Happy anniversary! Looks like a wonderful trip. How wonderful !! You guys are so lucky to have found each other 45 years ago:) Happy anniversary! It sounds like you two had a wonderful time Gail. I think your cake turned out just fabulous. Happy Anniversary! I looooove cruises, and yours sounds heavenly! Based on your crafting skills, I'll bet your cake was the best in the class. Amazing! Congratulations on celebrating 45 years of marriage! Looks like you had a fantastic time. Looking forward to being your newest follower! Cheers. 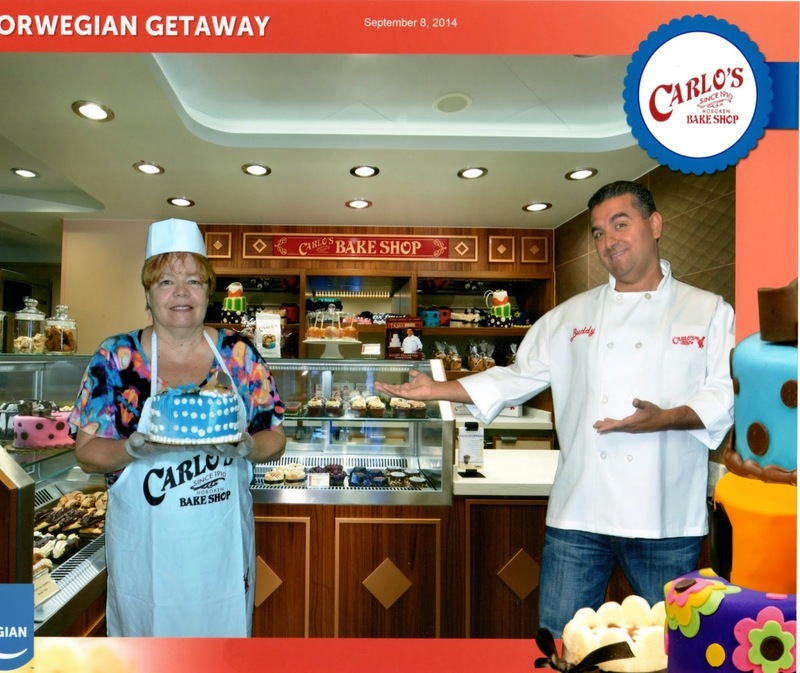 How fun to see your anniversary cruise pictures! Good-looking couple! I loved seeing the fantastic 45 anniversary display on your bed and the great photos of you and your pretty cake. 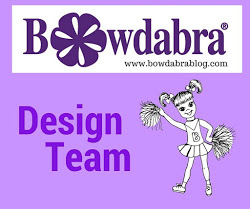 Did you wear your DIY necklace on the trip? 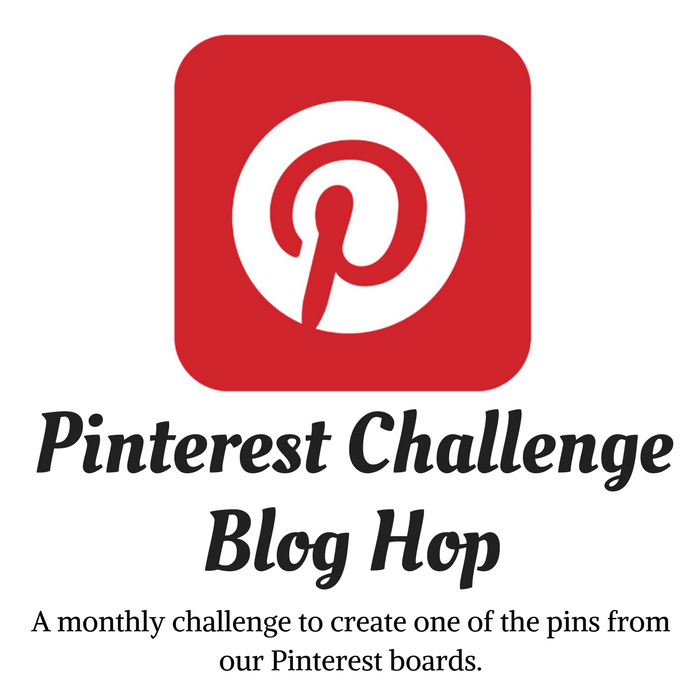 How fun is this post??!!! 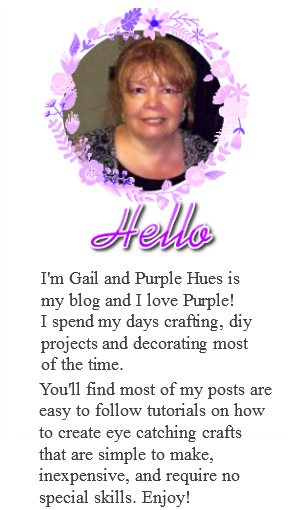 I love it Gail and about time you shared Gerald with us a little! You two look so happy and relaxed. Guess that's part of the purpose of a cruise, right? How fun that your staff was so attentive and the anniversary decorations...so nice! And look at you bein a cake boss! Totally fun! I probably would have gotten carried away with that fondant too. What a great time you must have had. Happy belated anniversary my friend! Happy Anniversary. That looks like heaps of fun, what a great way to celebrate. Cake decorating is way harder than it looks, my sister is a cake decorator and she can spend 20 hours on one cake, you did a great job. Wow!! You have celebrated your 45th anniversary in such a nice manner. It really seems a perfect and romantic location dear. I will select such vow renewal location for my 1st anniversary party. Wonderful decoration done by your planner. Great job dear.